We’re still leafing through Vogue‘s 770+ page September issue and the magazine is already moving on with the unveiling of its October 2017 cover. 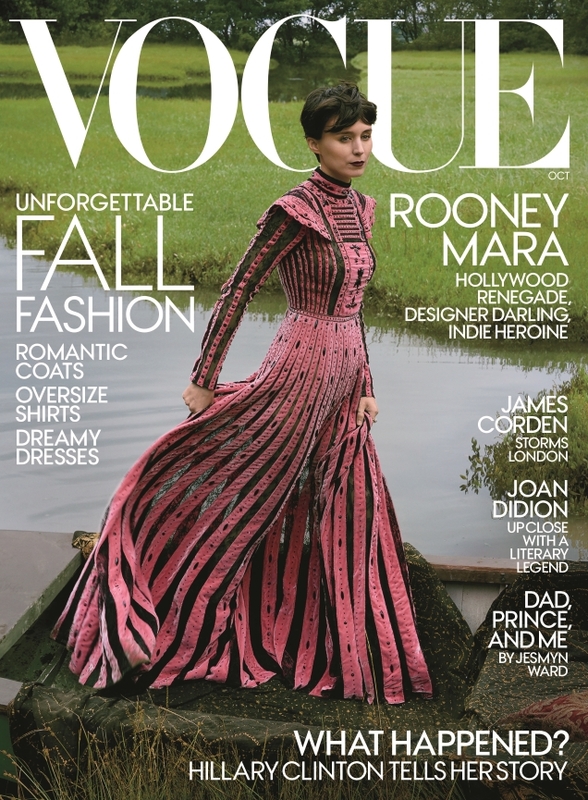 Four covers featuring Jennifer Lawrence is a tough act to follow but Vogue welcomes back Rooney Mara as its latest cover girl. Sticking with Annie Leibovitz for yet another month, the American actress was photographed on location at the Antony Woodland Garden in Cornwell, England (British Harper’s Bazaar much?). Complete with styling from Tonne Goodman, the team serve up a picturesque and tranquil cover story with Rooney wearing Valentino in the cover image (below). Right from the start, our forum members weren’t feeling it. “This cover must have been last minute decision! This is not something Anna would pick. And what’s up with two consecutive covers with flowering dresses, and the cover star not facing the camera? Tragic. Unforgettable Fall? More like forgettable cover,” slammed MON. “Looks like a backstage shot,” pointed out mikel. “Bizarre! She’s not looking at the camera and she looks like she’s preparing her face for the next shot, pulling her cheeks in and puckering her lips,” t-rex wrote. “I don’t really understand US Vogue‘s thing with Rooney. At least with the Sienna [Miller] obsession, she delivered fairly decent editorials. Rooney is always just so flat to me,” honeycombchild complained. “I don’t care what upcoming movie she’s promoting. We did not need another Rooney Mara cover – much less one that’s this uninspired,” orchidee said. “Very odd and weak cover, it seems to be an outtake indeed and the editorial is a snooze fest. NEXT!” demanded Bertrando3. See more from the shoot and share your own opinion here.